Home » Posts Tagged "BQ Training"
Here is my report for week nine of sixteen of my Outer Banks 2013 marathon training . 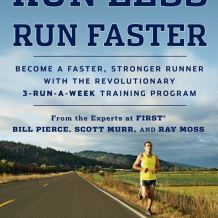 I am following the 3:25:00 Boston Qualifier plan outlined in the book Run Less Run Faster. Short version: Disappointing week. Bad news was I came up short on the track workout and the long run. Good news was it was my fastest twenty miler yet, just a bit short of target. Successfully completed the two prescribed swim workouts – 10 x (2 laps with 15 seconds rest); 4 kick laps; 10 x (2 laps with 15 seconds rest). I did the laps at a medium effort, I guess. Yep, Monday track time This week’s workout was 2 x 1600m at 6:31 with 60 seconds rest interval followed by 2 x 800m in 3:08 with 60 seconds rest interval. Grade: B-. Not happy with this workout at all. After two really solid weeks to end the first half of the training, I wanted to kick off the second half on a good note. I had two problems here. The first, and probably biggest factor, was I did a terrible job of hydrating and fueling during the day. I sat in a training class at work all day and did not follow my usual eating and drinking routines. Once I went out too fast on the 1600s (problem number 2), the lack of proper preparation showed, as I hit the wall on the 800s and could not make myself go. On the positive, this was a good reminder of the importance of proper nutrition, even for a work out. Grade: A. That’s a 7:10 pace for the four hard miles. It was also a negative split and a step down (each mile faster than the previous). The second half had more downhill, but it was still a very good workout. Grade: B. This run was a struggle from early on. I knew by mile seven that the last thirteen miles would not be fun. About mile fifteen, with the sky sunny and the temperature around 75 degrees, the wheels started getting pretty wobbly. Then, with three miles to go, I was still on track, but, unfortunately, it was crash and burn time. The last three miles were 8:34, 9:21, and 9:00. I finished in 2:49:06, an 8:26 pace. Very disappointing week after the last two outstanding weeks. I was reminded of the importance of nutrition and hydration, even in training. I also have some work to do on my long run nutrition planning. Run #3: 15 miles @ 8:09/mile. Going to be a another tough week all around. 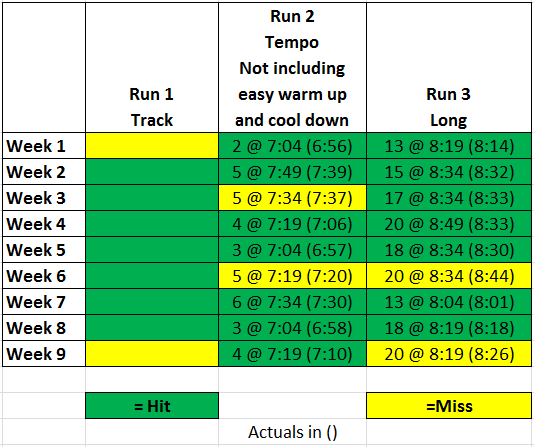 Here is my report for week seven of sixteen of my Outer Banks 2013 marathon training . 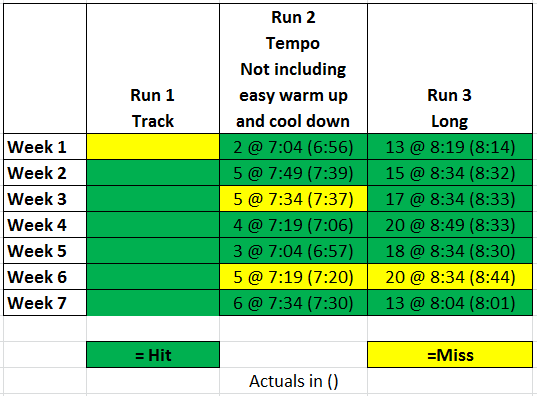 I am following the 3:25:00 Boston Qualifier plan outlined in the book Run Less Run Faster. Short version: One of the best weeks yet. Especially satisfying after last week’s tough time. Successfully completed the two prescribed swim workouts. This week’s swims were the longest yet, but complicated. Had to do three sets of free style like this: 1 fast, 1 easy, 2 fast, 2 easy, 3 fast, 3 easy, 2 fast, 2 easy, 1 fast and 1 easy. There was a one minute rest between sets. Also managed to get in an hour easy bike ride on Sunday. Track time. 6 x 800m in 3:08. Being the Labor Day holiday, I was able to go in the morning to beat the heat instead of after work. I did a leisurely bike ride the 4+ miles to the high school as a warm up, and used the return trip as my cool down. Grade: A. Speed work is tough at 8am, but I did it. I was just about out of gas on #6 and had to dig deep. Grade: A. Finally a solid tempo run and one of the best of the seven weeks, averaging 7:30 per mile. The temperature at 7:00pm when I started was close to 90, but the humidity was no where as oppressive as last week. Did a new route for this run as my son swam at the gym. This allowed me to treat myself to a Chick-fil-a chocolate milkshake afterward. That was good. A short long run. Yea! First 13 miler since week one and a welcome break from the 18’s and 20’s. Goal pace was ramped up a bit, though, at 8:04. A crazy schedule for the week pushed the run out to Saturday. This turned out to be a good thing as I headed out early to temperatures in the mid 60’s. A nice solid negative split run. Broke the 8:00 mark for each of the last four miles, including saving my fastest mile for last at 7:46. Ended up 1:44:26, an 8:01 pace. A good bounce back from a disappointing previous week. Run #1: Track work. Bunch of 400’s for the first time. Two sets of 6×400 in 1:32, taking a 90 second rest interval been each 400. Take a 2:30 break between sets and do it again. Run #2: 2 miles easy, 3 miles @ 7:04/mile, 1 mile easy. Run #3: 18 miles @ 8:19/mile. Cross Training: Swim 25 minutes any stoke and kick board. Much easier to keep track. The long run looks to be the toughest for me this week. 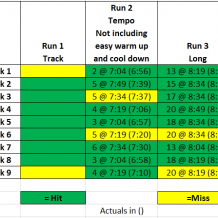 Here is my report for week six of sixteen of my Outer Banks 2013 marathon training . 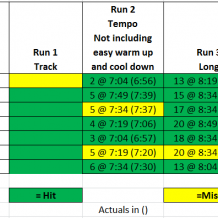 I am following the 3:25:00 Boston Qualifier plan outlined in the book Run Less Run Faster. Short version: Tough, disappointing week, but still feel like I’m OK. 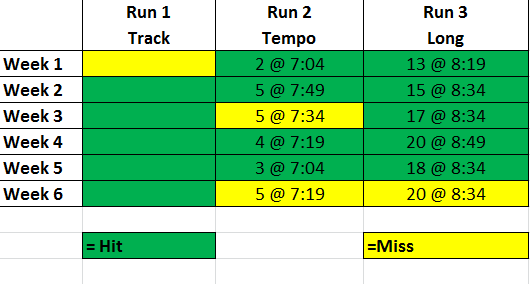 Completed track work successfully and was a whisker short on my time goal for Run #2, the tempo run. However, I did not have a good long run. The goal for the 20 miler was an 8:34/mile pace and I could only manage an 8:44 pace. Successfully completed the two prescribed swim workouts. This week’s swims called for five sets of eight laps free immediately followed by two laps of kick board, allowing a one minute rest interval between sets. This was a good tough workout. I was also able to get in a two hour bike ride on Saturday morning. The usual weekly trip to the high school track. This week’s workout was a new one, calling for two 1200 meter runs at 4:47, followed by six 800m runs at 3:08. There was a two minute rest interval between runs. Grade: B+. The taste of low humidity fall disappeared by Wednesday night, and we were back to typical hot and humid August. I wanted to do a negative split, and after the first two miles, I realized that would be very difficult to do. My effort level was near 100%, but with the almost 90 degree heat, I felt like I was stuck in the mud. With one mile to go my overall pace was 7:25/mile, and I thought there was no way I could hit 7:19. The last might was slightly downhill, and I was huffing and puffing as hard I could. As my watch beeped, I hit stop and switched modes to see my pace – it said 7:19. Couldn’t believe it. However, when I plugged the individual miles into a spreadsheet to get the average, it said 7:20. Since I don’t want anybody to think I’m an easy grader, I’ll go with 7:20 and give myself a B+. The long run for the week called for the second of five 20 milers in the plan. Target pace was 8:34/mile. Having completed 18 last week at 8:30, I felt like I could do this. When I walked outside at 6:15 am, I knew I had a tough task in front of me. The sun wasn’t up and it was 75 degrees and high humidity – almost 100%. This run seemed like a continuation of Wednesday’s tempo run – I was putting forth the effort but seemed to be in slow motion. With five miles to go, my overall pace window on my GPS watch said 8:39. Still have a chance, I thought and picked up the pace. I averaged 8:20/mile on miles 16 & 17, but that was all she wrote. I crashed and burned and averaged over 9:00/mile on the last three. Overall time was 2:55:15, an 8:44/mile pace. I lost almost five pounds despite consuming over forty ounces of water. Grade: B-. Maybe C+? A disappointment, for sure, but I will just have to chalk it up to the conditions. Run #1: Track work. 6 x 800m in 3:08 with 90 second rest intervals. Run #2: 1 mile easy, 6 miles @ 7:34/mile, 1 mile easy. Runs #2 & #3 are going to be tough. Fall weather needs to come back fast! Here is my report for week five of sixteen of my Outer Banks 2013 marathon training . 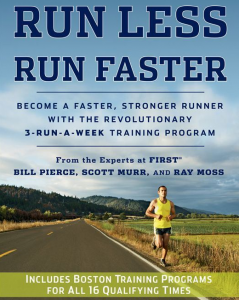 I am following the 3:25:00 Boston Qualifier plan outlined in the book Run Less Run Faster. To review week four, click here. To review week three, click here. To review week two, click here. Short version: Hit all the targets for the week. Still on track. For the long version, keep reading. Successfully completed the two prescribed swim workouts. This week’s swims called for five sets of 2 kick laps, rest 15 seconds followed by 2 swim laps, rest 30 seconds. For the freestyle laps, I tried to speed it up a bit. I was also able to get in an hour and a half bike ride on Sunday. Weekly trip to the high school track. This week’s workout was the same as week one, three 1600m (one mile) repeats in 6:31, with a 400m rest interval. In week one, I went out too fast in the first mile (6:13), and didn’t quite meet the mark on miles two and three (6:35 & 6:40). This week, I wanted to be more consistent. Some afternoon storms had cooled the temperature to 76, but I still had high August humidity. Grade: A. First two of these were not too bad. The last half of number three was painful. Grade: A. Average pace for the three fast miles: 6:57! The long run for the week called for 18 miles at an 8:34/mile pace. This week was more August-like as the humidity returned and the morning low was in the seventies, instead of last week’s mid sixties. I left at sun up to beat the heat, and had a goal of another negative split. Since I hit an 8:33 pace in last weeks 20 miler, I wanted to be closer to an 8:30 pace for this run. After nine miles I was right on track at 8:33/mile. I was able to crank it up a bit, but the humidity was weighing on me. I managed 8:26/mile on the second half, coming in at 2:33:16. This was 8:30/mile overall pace for the run. Mission accomplished. Another very good week. I was definitely aided by some cooler weather on the short runs. Still feeling good about my progress, and my foot had a good week. However, there are dark clouds looming on the horizon. The upcoming week looks to be the last of the easier weeks, both in workouts and family schedules. Week seven workouts take a serious intensity jump, and my day job is going to be very hectic that week. Also,my son’s high school cross country mid-week meets start up in week seven, and shortly after that, my daughter’s soccer practices and games start. Things are going to get interesting. Run #2: 1 mile easy, 5 miles @ 7:19/mile, 1 mile easy. Run #2 worries me most week. The last time I had five tough miles for the tempo run (back in week 3), I missed the target by a couple of seconds per mile due to some tough long hills. This time, I’ll keep the hills shorter, but that is a tough pace. I think it is gonna hurt. Here is my report for week three of sixteen of my Outer Banks 2013 marathon training . 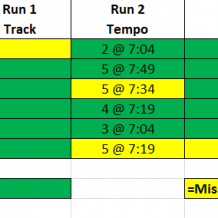 I am following the 3:25:00 Boston Qualifier plan outlined in the book Run Less Run Faster. Short version: A solid week. Right on target for the Runs #1 (track/speed) and #3 (long). Tried a different route on run #2 (5 mile tempo) and encountered some tough hills, coming up a few seconds per mile short of target. No big deal. Still feel I am on track. For the long version, keep reading. Some scheduling conflicts this week meant swimming on Monday and Wednesday. Successfully completed the two prescribed swim workouts. This week’s swims called for doing the 20 lengths kick board again, as in week one, but this time, the rest interval dropped from 30 seconds to 20 seconds. No big deal, other than this is harder than it sounds to any non-swimmer. I was glad to complete them. This drill works on ankle flexibility and hip strength. The only other cross training for the week was 700 yards of free style swimming before and after these kick board workouts. I contemplated a long swim or bicycle ride on Friday but decided to rest up for my long Saturday run. Grade: A. Felt great. Aided by unusually cool weather. Grade: B+. The hottest run yet in the three weeks of training at 90 degrees. I tried a new and different route near the high school during my son’s cross country practice. This turned out to be a mistake. I am not opposed to hill work at all, but during these timed runs, I tried to limit the hills. Unfortunately, I underestimated the hills on this route. From the 2.5 mile mark to the 4 mile mark, the course had 260 feet of climb. By the time this kicked my tail, I didn’t have anything left to make up the lost time in mile 5. I ended with a 7:37/mile pace for the five miles. A great workout, but a tad short of goal. Here is the elevation graph of the file mile tempo run. I’ve highlighted the tough climb. Elevation Map of Five Mile Run. The last run for the week called for 17 miles at an 8:34/mile pace. This was the same pace as last week’s run but two miles farther. After last week’s miserable finish with stomach issues, I was concerned about adding two more miles. I hoped the electrolyte tablets I experimented with in my water last week were to blame for the problems, so I scrapped them this week. In addition to adding a few more ounces of water to my Camelbak hydration pack, I took along electrolyte pills and three gels. I also left a bottle of ice water at the entrance of my neighborhood in case of emergency later. This turned out to be the smart move of the day. The dumb move of the day turned out to be my start time. I slept in a bit longer and did not hit the road until almost 7:00am. Mistake. The weather was typical muggy August morning and there were no clouds in the sky. Fortunately, there was a good bit a shade on the roads I chose, but I couldn’t avoid the sun completely. By mile 11, it was approaching 80 degrees and every bit of my clothing was completely soaked in sweat. I passed entrance to my neighborhood at this time. I had plenty of water in my hydration pack, but I still made use of my stashed water bottle by squirting the ice cold water on my head. This was just the boost I needed. For the last six miles, I kept my head cool this way. With two miles to go, my overall pace was 8:35/mile. Time to step it up. I managed to push hard and finish the last mile in 8:18, completing the 17 miles in 2:25:45. This came out to be an 8:33/mile pace. A good solid week. As with last week, I feel like I’m still on track. The body feels pretty good, and I’m not sensing any early signs of trouble. I’ll be experimenting with nutrition on the long runs (and the days before) to see if I can dial in the proper fuel. Run #1: Track work. 5 x 1000m in 3:56 with 400m rest intervals. Run #2: 1 mile easy, 4 miles @ 7:19/mile, 1 mile easy. Will try to find a flatter layout of this run. Cross Training: Swim and kick for 20 minutes straight. Runs #1 and 2 worry me this week.